We exited I-40, the drab road that shows you the turned backs of little towns. If you never got off the freeway, you’d never see the pretty faces, only the stone backs of towns fringed by gas stations and sad restaurants struggling by on people passing through. North we went, into the Navaho nation. It felt good to get off the freeway. “Just a few more miles to the turn-off,” I told Clint after consulting the map. We weren’t far from the freeway and already the scenery had improved. The flat dry earth transformed into gentle rolling hills with folds of green grasses‑-the shrubs and trees just beginning to set energized buds of brilliant green. We were going to Wide Ruin: a place where a once well-known trading post had been. We followed an old truck, plodding along slower than necessary. The curves and bumps in the road prevented us from passing. We came upon “The Turn-Off”, a dirt road angling off to the right. “Maybe there’s a new one now, maybe they rebuilt it; it’s been years since it burned down,” said Clint. Wide Ruin is known for a specific style of rug weaving: pieces with bands of earthy colors, bound by narrow, contrasting rows to delineate the color shifts. I’d come to know the attributes and appreciate the subtle beauty of these weavings under Clint’s tutelage. The road was bumpy, with deep tire ruts squished into the surface after the last rain. A few side grooves still held water, while the center was a map of deep cracks. The truck ahead of us had turned off on the same road. The driver sped up, now more comfortable with the rugged road close to home. The track curved back around to the north and down into a dip. Here we found these adobe ruins. Were these the remains of the trading post? Or, the ugly leftovers of an Indian school? Was this a place where they force-fed Christianity and took away the People's culture, their language? 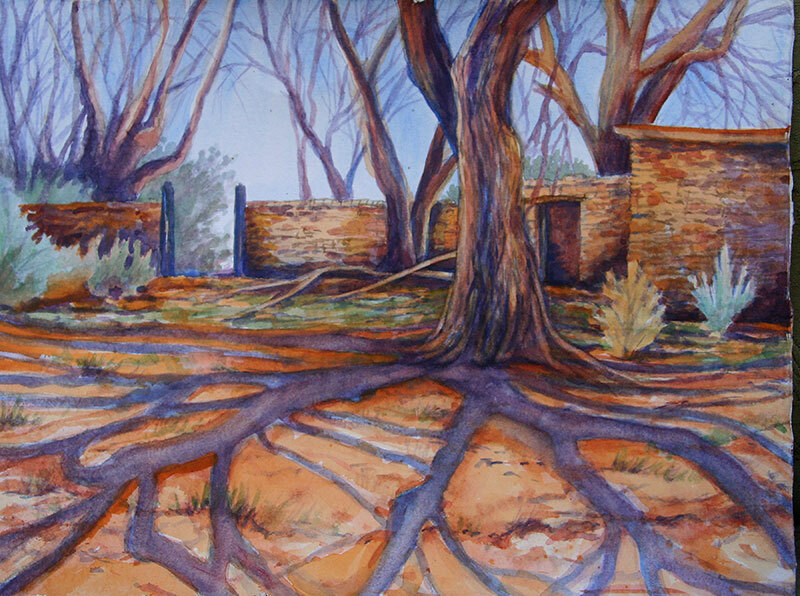 I was captivated by the long shadows, the brilliance of the sun, and the faded-to-a-memory adobe walls. Though I’d hoped for a dusty surprise of a trading post, this was all we found in Wide Ruin. The map showed the road was supposed to loop back to the highway, but all we found was a school with warning signs that demanded we register at the office. We turned around, drove back past the ruins of Wide Ruin, and bumped our way back to the highway.